Nazi Germany’s ally Hungary worked hard to develop a tank that could stand up to Soviet armor, but to no avail. By mid-January 1945 Germany was being pressured on all sides by Allied forces. Hitler’s much-vaunted Ardennes Offense had been thrown back with appalling losses, the Soviet Red Army had invaded German soil, and the Hungarian capital of Budapest had been besieged for weeks. Alongside German troops fought soldiers and airmen from Hungary, Germany’s sole remaining ally in Europe. Like all combatants, the Royal Hungarian Army, known as the Honved in its native tongue, possessed an armored force. But, by this time, all Hungarian units with armored components had been severely depleted by constant fighting against a numerically and materially superior foe. To give their ally a chance in combat against the armored forces of the Soviet and Romanian armies, Germany sold and loaned tanks to the Hungarians. At this stage of the war, these included the Panzerkampfwagen (Pzkpfw) IV, the Pzkpfw V Panther, and even the Pzkpfw VI Tiger I. For a brief time these German machines fought alongside a Hungarian-built tank—the Turan. Though built by Hungary, the Turan was based on the Škoda T-21 medium tank prototype from the former Czechoslovakia. Even before the hard experience suffered by its Second Army on the Eastern Front, Hungarian officials realized the tankettes and light tanks, such as its own 38M Toldi, were completely unsuitable as the main battle tanks of its armored forces. While its mobile contingents were being overwhelmed far from home on the Don River in late 1942 and early 1943, the Hungarians had been designing, testing, and building the first version of the Turan, known as the 40M Turan, whose origins can be traced to late 1939. Hungary tested the T-21 in a series of extended trials. In the course of negotiating for the manufacture license, a few modifications were requested: increase the armor to 35mm, replace the rotating command cupola with a fixed one, replace the electrical equipment with Bosch-built items, and exchange the 47mm main gun for a 40mm gun. The reason behind the reduction in main gun caliber was that the Hungarians already had a 40mm cannon that possessed a significantly higher muzzle velocity—820 meters per second (m/s) compared to the Škoda’s 47mm gun’s 590 m/s—and used the same shell as the common Bofors 40mm antiaircraft gun. In July 1940, the Hungarians successfully negotiated purchase of the license to build the T-21. It took almost a year before the first Turan prototype was finished in June 1941, and it was not until July 1942 that production was officially given the go-ahead. More than 200 modifications, corrections, and adjustments were necessary due to flaws discovered in the original prototype. Among these corrections was a new radiator designed to overcome issues with the transmission and, more importantly, overheating of the engine. New types of armor plating had to be developed as the required armor thickness was beyond the capability of Hungarian steel mills. Production of the Turan was undertaken by four major Hungarian firms: Manfréd Weiss, Ganz, MAVAG, and Magyar Vagon és Gépgyár. In addition to producing the vehicle, each firm was responsible for specific components and would supply these parts to the other manufacturers. The production model of the 40M Turan had a crew of five, which was the standard for medium tanks. A 260hp, water-cooled V-8 petrol engine built by Manfréd Weiss powered the 18.2-ton tank. This allowed for a maximum road speed of 29.3 mph and a maximum range of 102.5 miles. Along with the 41M 40mm main gun, a pair of 8mm machine guns were installed as armaments. One of these was co-axial with the main gun while the second was located in the hull. For ammunition, around 3,000 rounds were carried for the two machine guns as well as 101 rounds that could be stowed on board for the 40mm main cannon. Completing the third part of the trinity of performance, firepower, and protection when discussing tanks and other armored fighting vehicles (AFV) was the armor. On the 40M, thickness varied from 50mm to 25mm to 13mm, depending on the location and its relative importance. Total production numbers from the four firms assigned to manufacture the 40M Turan, or Turan I, were 285 tanks with Hungarian industry producing 230 vehicles in 1942. The 55 vehicles produced in 1943 were part of an order placed for an additional 309 tanks. However, combat experience had shown that any caliber gun less than 75mm was impractical due to the armor thickness of Soviet tanks. This was one reason why the original order number was never attained. The production figures included the combat model as well as a command version, which was fitted with two more radios and additional antennas. By the end of 1943, the Honved began receiving the new tank beginning with the First Hungarian Armored Division. This division was being reconstituted after being annihilated on the Don River while part of the Second Hungarian Army during the Soviet Union’s offensive in January 1943. 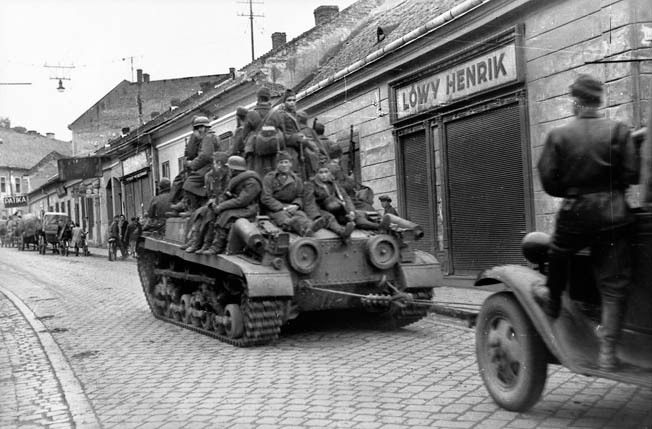 Shortly after this, the Second Armored Division and the First Cavalry Division, also called the First Huszar Division, began receiving the Turan I.
Hungarian troops ride a 41 M Turan II tank during the withdrawal of German and Hungarian troops from Romania to Hungary in August 1944. The Turan is also towing a truck. In comparison to the main battle tanks being used by Germany, the Soviet Union and even some used by Romania, the Hungarian-built Turan I was already obsolete when its baptism of fire occurred with the Second Armored Division in April 1944 against the Soviets in the Galicia region, located in modern-day western Ukraine. During development and early stages of testing of the 40M Turan, it became evident that another vehicle was needed to complement it. Observing the armored vehicles used by the Germans, as well their tactics, which allowed them to successfully conquer most of Europe, had an influence on Hungary’s decision. Out of this need was born the 41M Turan, which was designed to be a heavy support tank for the medium 40M Turan. The main difference was a new main weapon—in this case a low-velocity 75mm L25 gun with a muzzle velocity of 500 m/s. Due to the increased size of the 75mm gun, a larger turret had to be designed and built. However, to reduce potential production delays, it still had to be able to fit on the Turan I chassis. Development of the 41M prototype was not completed until 1942. Testing of the new tank delayed actual production until early 1943. From combat experience, armor plating for the 41M Turan II was increased in some areas by 30 to 40mm. The larger main gun and increase in protection also increased the vehicle’s weight by a ton, which had a detrimental effect on the Turan II’s overall performance as it still used the same 260hp engine to power it. Performance on both the 40M and 41M would decrease further when even more protection was added to hull and turret in the form of skirting plates. These pieces of armor, spaced several inches away from the vehicle’s hull, were becoming standard on German tanks to protect the thinner side armor against Allied tanks and antitank weapons. Production figures indicate that only around 180 vehicles were manufactured by the end of 1944, yet the same source states that three of the four Hungarian firms that built the Turan I only built 145 41M Turan 75s. One possible explanation for the differing numbers could be the fact that some 40M Turans damaged in combat were sent back to Hungary to be upgraded, thus conceivably accounting for the 35-vehicle difference. The upgrade involved the removal of the Turan 40 turret and installing the turret of a Turan 75. The modification was a relatively easy procedure as the shape and diameter of the turret rings was designed to be the same. 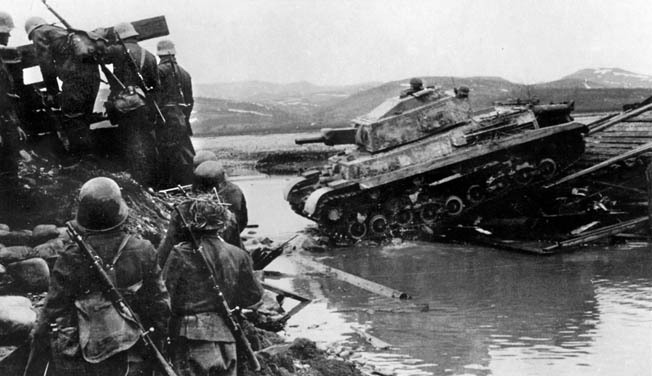 Hungarian panzergrenadiers accompany a Turan II across a stream in Russia in 1944. Delivered first to Hungary’s Second Armored Division in July 1943, the newer Turan model was then sent to the First Armored and First Huszar Divisions, the latter just happening to be the favorite of Hungary’s leader, Admiral Miklós Horthy. While the divisions were undergoing training with both versions of the Turan, the Hungarians officially changed the designation of the 41M Turan II to 41M Turan 75, as well as the 40M Turan I being called the 40M Turan 40. Even though it was the best tank built by the Hungarians, by the time the 41M Turan 75 entered service in Hungary’s armored forces, it was on the verge of obsolescence. While the 41M Turan 75 was being manufactured and delivered, the Hungarian high command had decided to order the development of a Turan model that, on paper, would be close to the modern tanks used by the Germans and Red Army. Designated the 43M Turan 75, this vehicle would be armed with a long-barrel 75mm based on the very successful German PAK40 gun that would allow the Hungarian armored forces to be more effective against their enemies. Like many Axis designs at this stage of World War II, progress beyond the design stage was limited. Allied air raids, a lack of enough strategic materials for manufacture, and problems during the test trials of the new 75mm gun complicated this vehicle’s development. The German occupation of Hungary, which prevented Admiral Horthy from bringing his nation over to the Allied side, effectively canceled the project in the autumn of 1944, leaving an unknown number of prototypes. The combat history of both models of the Turan ended with the siege of Budapest in February 1945. By then most, if not all, Turans had been knocked out in battle, victims of mechanical failure or abandoned for various reasons. With Hungary’s factories overrun, there was no chance of receiving replacement vehicles or parts. Among the last known engagements of the Turans occurred December 7, 1944, when Battle Group Horvath fought at Perball, Hungary, northwest of Budapest. Out of 11 tanks, two were 40M Turan 40s; three days later, Horvath was reduced to only the pair of medium Turans. In regard to other tanks fielded during the war such as the German Panther, the Soviet T-34, the American M4 Sherman, or even the British Matilda or Italian M13/40, the Hungarian tank is an unknown commodity to the casual reader. In comparison to other main battle tanks when both versions became operational, the Turan was already inadequate for tank-to-tank combat. However, the Turan was Hungarian-built and is an example of what its industry could develop and produce in spite of the limitations and conditions it faced. The Turan did see significant combat and could, under the right conditions, defeat any Soviet light or medium AFV. The sole remaining Turan is a 41M Turan 75 captured by the Soviets and has been on display at the Kubinka Tank Museum in Russia. Tags Hungarian Army, The Eastern Front, Turan Tank.